Exasperating, bewitching, schizophrenic, addictive; the African continent is an assault on your sensibilities. 10: Celebrating Ten Years of the Tour d’Afrique Bicycle Race and Expedition is a powerful photographic journey of the gutsy men and women who have pedaled across Africa on the planet’s most exceptional bicycle adventure. Since 2003, riders and crew of the Tour d’Afrique have captured their intensely personal experiences as seen from the saddle of a bike; most of the time anyway. If you want to know what is required to undertake the gruelling, 4½-month bike trip from Cairo to Cape Town, this is the book for you: stunning photographs taken by the decade’s worth of explorers who have essayed the event, as well as quotes that document the life-transforming consequences riders have experienced. Introduction by Tour d’Afrique founder Henry Gold, whose once-madcap idea has been more than validated. Both the pictures and the text offer a vivid description of traveling by bicycle in places where recreational cycling is rare and novel. Several anecdotes are painful to read—children throwing rocks at the riders, for one—but 10 captures the event’s struggles and triumphs in a way that seems very real. With a foreword by Lonely Planet co-founder Tony Wheeler and an introduction by Tour d’Afrique founder Henry Gold, the 252-page volume is vicarious adventure at its best, and is a book worth savoring and slobbering over. It’s a book that deftly details the pain, the unending challenges and the daily suffering of a 12,000-km bicycle journey across Africa, yet it also leaves readers desperately wanting to join the riders through it all. The pages of 10: Celebrating Ten Years of the Tour d’Afrique Bicycle Race and Expedition feature big photos of harsh conditions, crashes and stunning views that riders encounter on the four month trip from Cairo to Cape Town. Over mud, sand, crumbling asphalt and even lava rock, riders — some inexperienced others seasoned racers — must overcome obstacles few cyclists will ever experience. In retelling their stories, the travellers featured in this book give you an uncensored account of the pain of days spent in the saddle and the exhilaration of having overcome a challenge of a lifetime. How do you find the strength to ride for four months? How do you stand the heat and punishing road conditions on an exposed bicycle? How strong are the bonds you’ll develop with the people you’ll meet on this journey? No question, no matter how intimate, remains unanswered in the pages of 10: Celebrating Ten Years of the Tour d’Afrique Bicycle Race and Expedition. Warning: If you are prone to random bouts of adventure-itis, do not open this book! 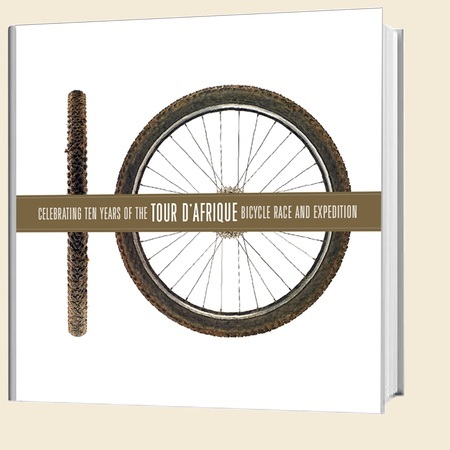 Celebrating Ten Years of the Tour d’Afrique Bicycle Race and Expedition is unlike any other coffee table book you’ve seen. Sure it’s got spectacular, colourful and inspiring images from across the African continent – but more than that it’s the story of adventure, of real people achieving something most can only dream about. The book celebrates the 10 years of what might be considered one of the world’s most interesting, if not toughest, rides. Four months from Cairo to Cape Town. Compelling short stories from riders who accomplished this goal highlight the stark images which portray both the beauty and harshness of the African landscape. This is a must-have for cycling and adventure enthusiasts! This is a book to be enjoyed over and over. Documenting the 10 year history of the Tour d’Afrique through a collection of stunning photographs and riders’ anecdotes, the book provides an insight into an incredible journey. The challenges the riders face as they cross the African continent on their, often brutal, four month journey are described in amusing, no-holds barred snippets. The reader spends half their time wondering why on earth anyone would take on such a quest and the other half wanting to join the adventure. The riders’ tales and the fabulous photographs describe both beautiful landscapes and harsh, inhospitable terrain. Africa is indeed a land of contrasts. 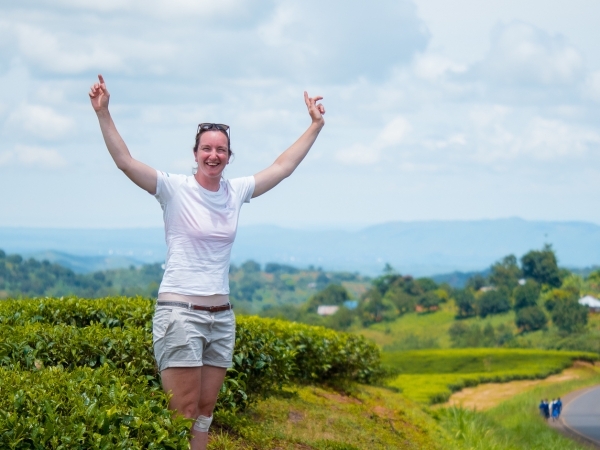 Through the book’s chapters we take a look at the people, the landscapes, the food and the languages and gain some understanding how, over the course of a four month tour, the bicycle can go some way to bridge cultures. 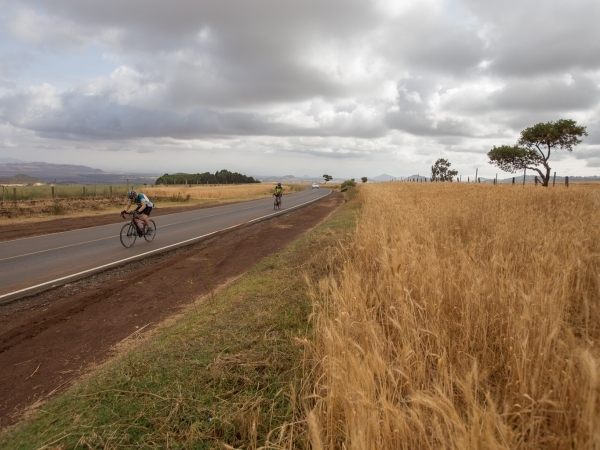 As they take on this ultimate test of endurance, though often exhausted, challenged, suffering from saddle sores and worse, the riders share with us an energy and passion that give the reader some understanding of what makes the Tour d’Afrique a special experience.